Why Would Anyone Want to Buy Yelp? Yelp may be the next company in play for larger tech firms seeking to increase their reach with users and local businesses. It's all because of one phrase -- User generated content. NEW YORK (TheStreet) –– Yelp (YELP - Get Report), the all-purpose local business reviewer, may be the next target for a major technology company seeking to increase its reach with consumers, and that's because of one factor: user-generated content. In an interview with TheStreet, Zillow (Z Chairman Rich Barton argued that companies such as Yelp that feature user-generated content (UGC), are very hard to replicate. Once they've won the name recognition battle, more user content prompts begets even more user content. "The UGC that Yelp has and that TripAdvisor (TRIP has, those are just dreamy," Barton said in a June 11 interview. "The more content you have, it attracts the more users to it. The more users, the more content. Now you have more content, it attracts more content." It's a waterfall, made heavier by the fury of social media. Speculation of a Yelp buyout follows last week's announcement that Priceline.com (PCLN would buy OpenTable (OPEN for $2.3 billion in cash. That deal prompted attention to turn to OpenTable's competitors, Yelp being chief among them. 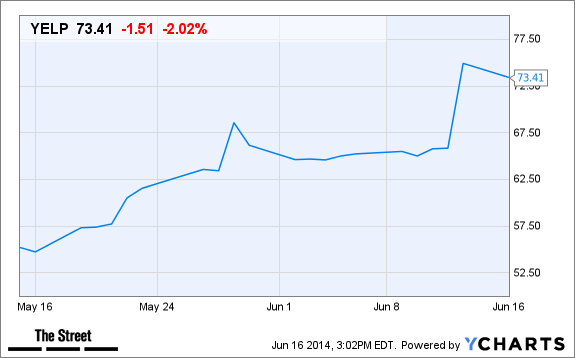 The OpenTable deal prompted Yelp to surge on Friday, gaining 14%. Despite the surge, that's still sharply below Yelp's all-time high, set back in early March, when shares peaked at $101.75. Shares on Monday rose 0.4% to close at 71.53. As Yelp continues to add more businesses and more users to its local-based services, the moat around the company gets bigger, and that's critical to sustaining the businesses, as it uses common language amid original content. For the first-quarter, Yelp lost 4 cents a share on $76.4 million in revenue, as cumulative reviews grew 46% year over year to approximately 57 million. Yelp noted that active local businesses continue to take to the platform, as there are now approximately 74,000 local business accounts on the service, up 65% year over year. Yelp's second-quarter guidance was above what Wall Street was expecting, as the company expects sales between $85 million and $86 million, slightly ahead of what Wall Street was thinking, at $85.44 million in sales. The company also bumped up its full year revenue guidance, as it now expects sales between $363 million and $367 million, representing 57% growth. Following the quarter, Jefferies analyst Brian Pitz, who rates Yelp shares "buy" with a $100 price target noted how disruptive San Francisco-based Yelp has a chance to become. "Yelp reported another strong quarter as the company continues to disrupt the traditional offline directory business," Pitz wrote in a May research report. "We believe the overall opportunity is very large and that there is meaningful operating leverage left in the model, even as Yelp's moat continues to grow." 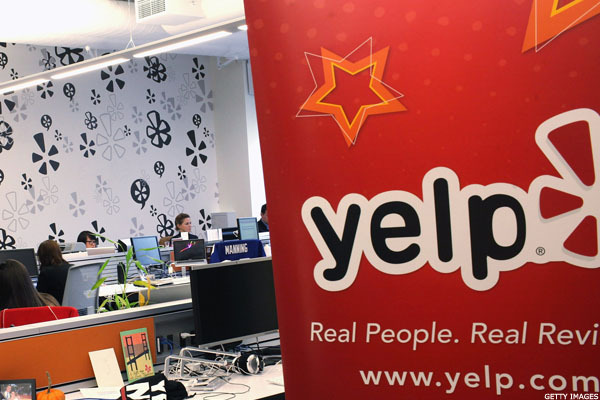 During the quarter, Yelp announced a deal with Yahoo! (YHOO, bringing Yelp's reviews, business information and star ratings to Yahoo! Search. Yahoo! has also been mentioned as a potential acquirer of Yelp, as has Google. "Potential acquirers of Yelp could include: Amazon, Ebay, Google, Microsoft, and Yahoo (plus some international players)," wrote SunTrust analyst Robert Peck in a research note, when discussing the OpenTable, Priceline transaction. Peck's research note isn't the first time Yahoo! has been mentioned as a potential acquirer of Yelp, as CEO Marissa Mayer continues to build out Yahoo! in her vision. Mayer was rumored to be sniffing around Yelp last year, as she focuses on increasing Yahoo! 's presence on mobile devices. She also tried to buy Yelp while she was still at Google (GOOG - Get Report), but that never happened. Yahoo! could not be reached for comment for this story. With the pending OpenTable purchase and Yelp boosting revenue guidance for 2014, it's becoming clearer that mobile, particularly user generated content on mobile, is being seen as differentiators for companies when it comes to attracting users. Amazon (AMZN - Get Report) is rumored to be launching a local services marketplace, with a potential roll-out in San Francisco and Seattle before a nationwide reveal. "We all value it [UCG] quite highly," Barton said. "It spins and spins and spins. This is the moat around the business, and it gets wider and deeper every day."